Tate Modern presents the UK’s first major retrospective of the work of Anni Albers (1899–1994). This exhibition brings together her most important works from major collections in the US and Europe, many of which will be shown in the UK for the first time, to highlight Albers’s significance as an artist. Opening ahead of the centenary of the Bauhaus in 2019, it is long overdue recognition of Albers’s pivotal contribution to modern art and design, and part of Tate Modern’s wider commitment to showing artists working in textiles. Anni Albers combined the ancient craft of hand-weaving with the language of modern art, finding within the medium many possibilities for the expression of modern life. Featuring over 350 objects including beautiful small-scale studies, large wall-hangings, jewellery made from everyday items, and textiles designed for mass production, this exhibition explores the many aspects of Albers’s practice - such as the intersection between art and craft; hand-weaving and machine production; ancient and modern. Significant weavings such as Ancient Writing 1936 and Six Prayers 1966-67 - Albers’s moving memorial commemorating the six million Jews who died in the Holocaust, commissioned by the Jewish Museum in New York - are shown in this country for the first time. 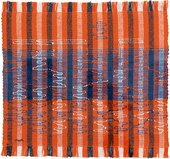 The artist’s lesser-known commissioned works exploring the relationship between textiles and architecture are also highlighted, including Albers’s designs for a large wall-hanging at the iconic modernist Camino Real hotel in Mexico City in 1968. The exhibition design itself takes inspiration from the artist’s own writings, such as her seminal essay ‘The Pliable Plane: Textiles in Architecture’, 1957, in which Albers advocates ‘a new understanding between the architect and the inventive weaver’. Born in Berlin at the turn of the century, Annelise Else Frieda Fleischmann became a student at the Bauhaus in 1922, where she met her husband Josef Albers and other key modernist figures like Paul Klee. Though the Bauhaus aspired to equality between the sexes, women were still discouraged from learning certain disciplines including painting. Albers began weaving by default, but it was in textiles that she found her means of expression, dedicating herself to the medium for the majority of her career. The exhibition explores how, here in the school’s vibrant weaving workshop, traditional hand-weaving was redefined as modern art. It brings together the UK’s largest grouping of Albers’s weavings designed during this period, such as Wallhanging 1924 and Black White Yellow 1926, alongside exquisite studies, textile samples and works by Albers’s contemporaries, including head of the Bauhaus weaving workshop Gunta Stölzl (1897-1983). With the rise of Nazism and the closure of the Bauhaus, Albers left Germany in 1933 for the USA where she taught at the experimental Black Mountain College for over 15 years. While here she made frequent visits to Mexico, Chile and Peru, amassing an extensive collection of ancient Pre-Columbian textiles. These artefacts fuelled Albers’s thinking and making process and are shown at Tate Modern with her incredible body of ‘pictorial weavings’ - stunning woven works of art including With Verticals 1946, Epitaph 1968 and Tikal 1958. The exhibition focuses on Albers’s seminal texts, ‘On Designing’ 1959 and ‘On Weaving’ 1965, in which she reflects on the history of weaving as a global phenomenon, dating back thousands of years yet typically modern. In both her work and her writing, she presents a vastly expanded geography of modern art, drawing on sources from Africa, Asia and the Americas. A range of remarkable loans from The Josef & Anni Albers Foundation also showcase Albers’s ground-breaking late works - such as TR II 1970 and Red Meander I 1969-70 - revealing her constant development as a highly original abstract artist whose enduring influence inspires new generations of artists and designers around the world. Anni Albers is organised by Tate Modern and Stiftung Kunstsammlung Nordrhein-Westfalen, Düsseldorf. It is curated by Ann Coxon, Curator, International Art, Tate Modern, Professor Briony Fer, University College London with Maria Müller-Schareck, Curator, Stiftung Kunstsammlung Nordrhein-Westfalen assisted by Priyesh Mistry, Assistant Curator, International Art, Tate Modern and Linda Walther, Assistant Curator, Stiftung Kunstsammlung Nordrhein-Westfalen. The show is accompanied by an exhibition catalogue featuring new research on Albers’ work. Visitors are invited to view textile works by other artists including Lenore Tawney, Olga de Amaral and Sheila Hicks as part of Tate Modern’s free collection display Beyond Craft on view in the Natalie Bell Building until December 2018. The Terra Foundation for American Art is dedicated to fostering exploration, understanding and enjoyment of the visual arts of the United States for national and international audiences. Recognising the importance of experiencing original works of art, the foundation provides opportunities for interaction and study, beginning with the presentation and growth of its own art collection in Chicago. To further cross-cultural dialogue on American art, the foundation supports and collaborates on innovative exhibitions, research and educational programmes. Implicit in such activities is the belief that art has the potential both to distinguish cultures and to unite them. For press information contact rachael.young@tate.org.uk / kitty.malton@tate.org.uk or call +44(0)020 7887 8732 / 4906. High resolution press images can be downloaded from Tate's Dropbox. These images will expire when the exhibition has closed.